Special Deals on Fencing in Richmond | Fencing Unlimited Inc.
We proudly serve the areas of Richmond, Chesterfield, Hanover, Glen Allen, Midlothian, Mechanicsville and beyond. If you are in Central VA and not sure if we serve your area, just give our friendly staff a call to find out. 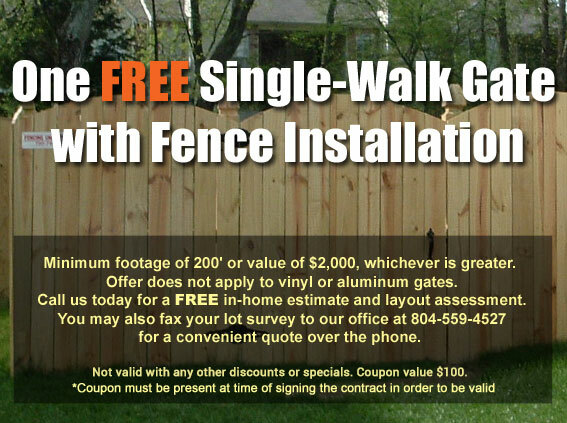 Fencing Unlimited, Inc. is your trusted fencing company serving Richmond VA and areas throughout Central Virginia. Call us today and let us custom design a fence that will protect your children and pets, fit your budget, and complement your home or business. Monday – Friday: 8:30 a.m. – 5 p.m.